Lures, catches and holds automatically! Our best selling model, the Mechanical Fisher’s Automatic Fishing Reel is simply the best way to catch fish. Our reels will set the hook and keep it set for you automatically, reducing lost fish and lost bait. 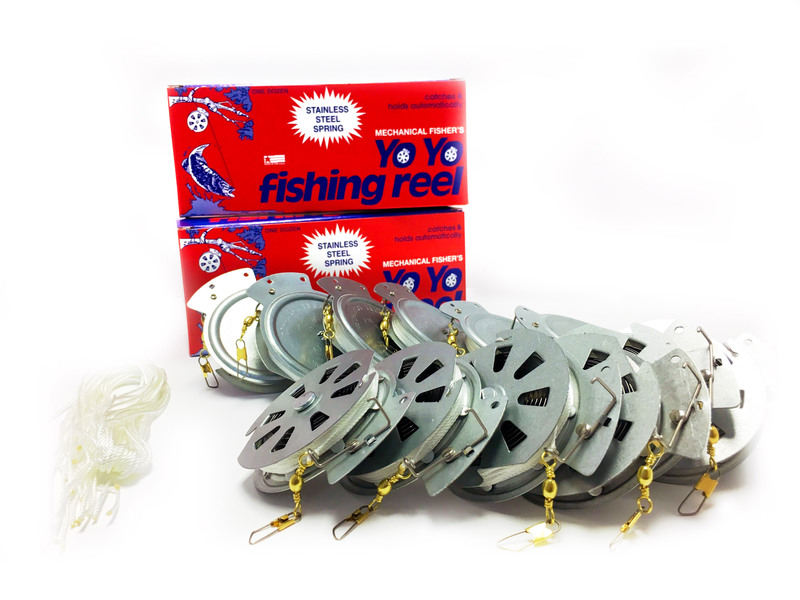 Proudly made in the USA, this reel features a galvanized steel body with a stainless steel spring, and approximately 8-10 feet of 60 pound nylon line. This reel is easy to use, long lasting, and most importantly, it will help you catch more fish! Great for fishing from docks, trot lines, limb lines, jug lines, ice fishing or tie it off the side of a boat. We have users tell us they have caught 5 times as many fish using the Mechanical Fisher as traditional fixed line fishing. Mechanical Fisher’s Automatic Fishing Reel comes in two varieties, a Wire Trigger and a Flat Trigger. Operation of both reels is identical. The only difference is the style of trigger. 12 Pieces of 24″ (+/-) long nylon braided line for attaching to tree, jug, etc. One piece of 24″ (+/-) long nylon braided line for attaching to tree, jug, etc. The Original! 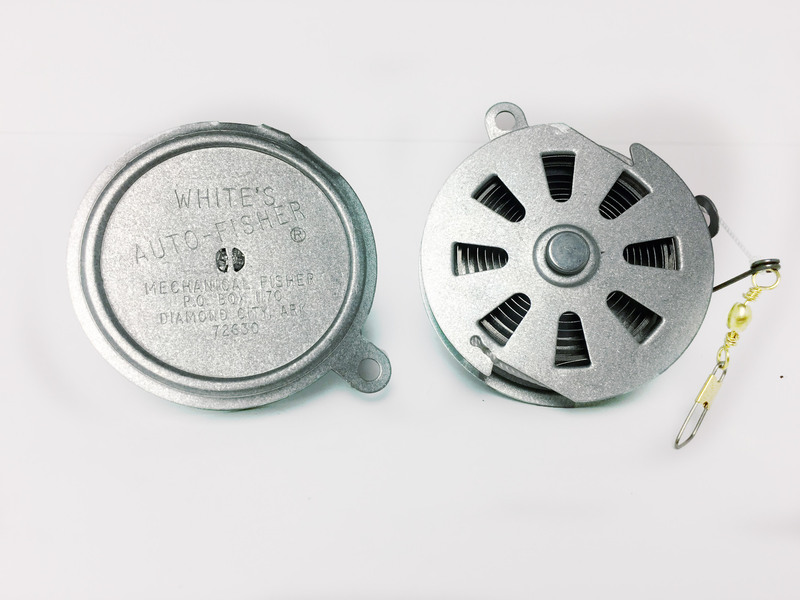 Since 1949, people around the world have been using the White’s Auto-Fisher to catch more fish. Use it on tree limbs, docks, sticks, boats, jugs and more. 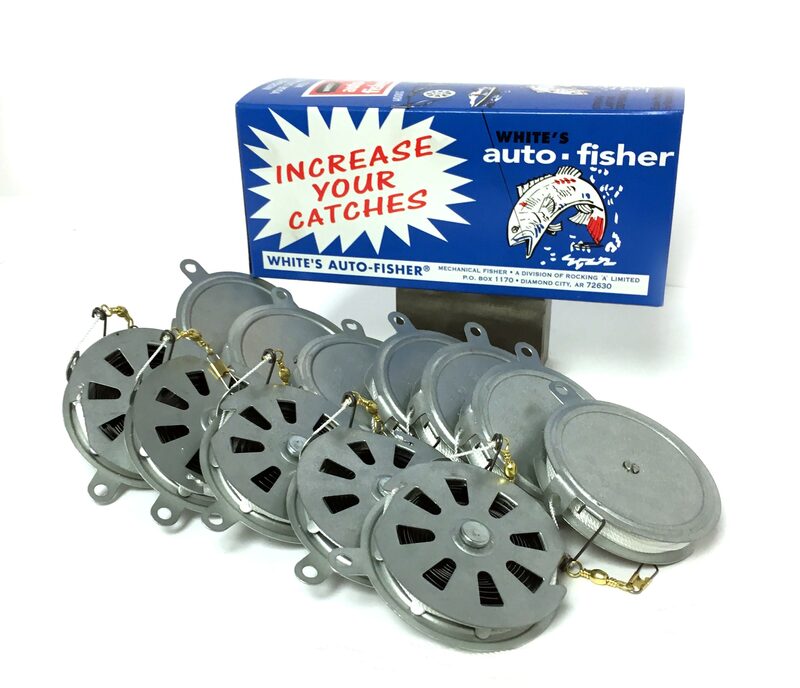 The Auto-Fisher will catch every type of fresh water and salt water fish including catfish, bass, trout, perch and much more. The secret to it’s success is it sets the hook and holds a tight line to the fish, just like fishing with a pole. 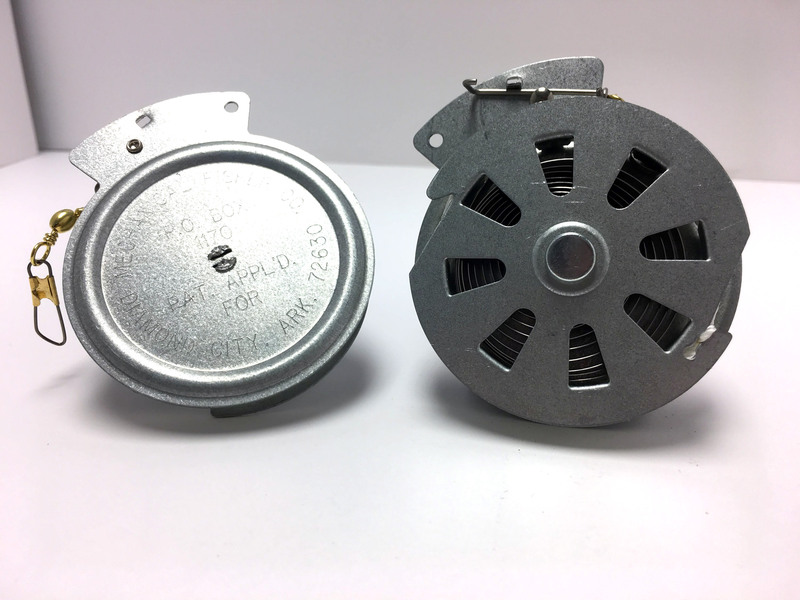 Proudly made in the USA, this reel features a galvanized steel body with a tempered carbon steel spring, and approximately 8-10 feet of 60 pound nylon line.